This April 25th, 2018 photo is one of my favorites. 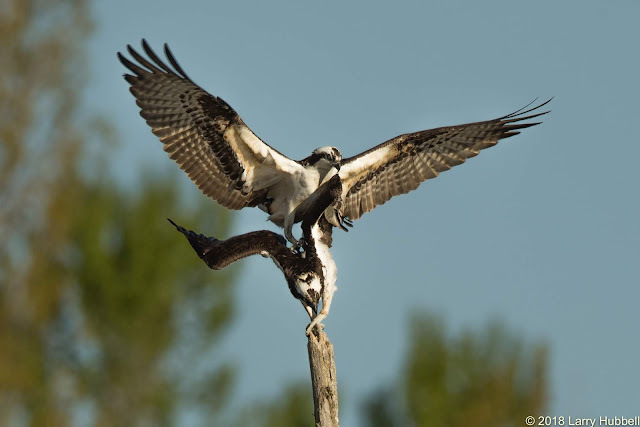 If I had unlimited time and skill I would attempt to carve a statue of Chester and Lacey, our Union Bay Osprey, in this pose. I love that Lacey is twisting and turning in an effort to support their weight while Chester, with wings extended, is fighting to maintain their balance. Every feather on Chester's wings appears perfectly developed and aligned. They have just completed the ever hopeful act of procreation. Two creatures with a single shared goal. They appear perfectly prepared to fill the future with their progeny. If you click on the photo and enlarge it you can see that between Chester's beak and the dark mark on top of his head are two symmetrical white spots. On Lacey's forehead the white marks are less extensive and also less symmetrical. Two days before Chester completed The Air Dance which was apparently quite successful in gaining Lacey's affection. Click on the highlighted link to read the earlier post. 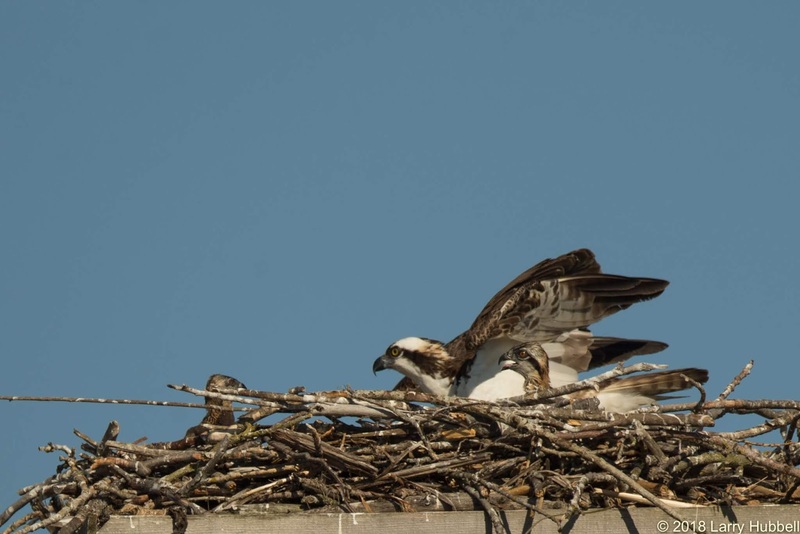 On May 14th Lacey settled down into the nest and appeared to be on-eggs. I heard reports that she was occasionally away from the nest after this time. 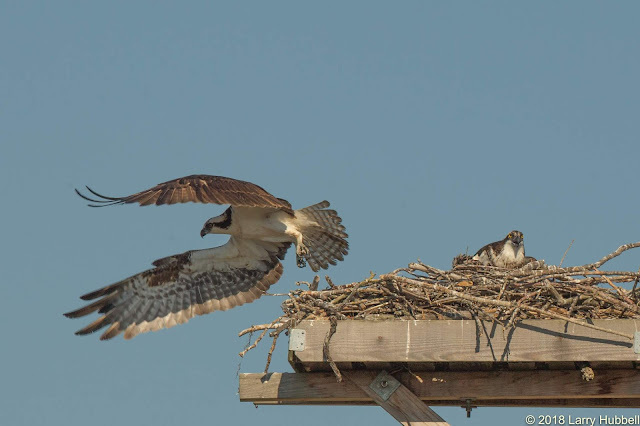 This seemed like unusual behavior for a mother incubating eggs. 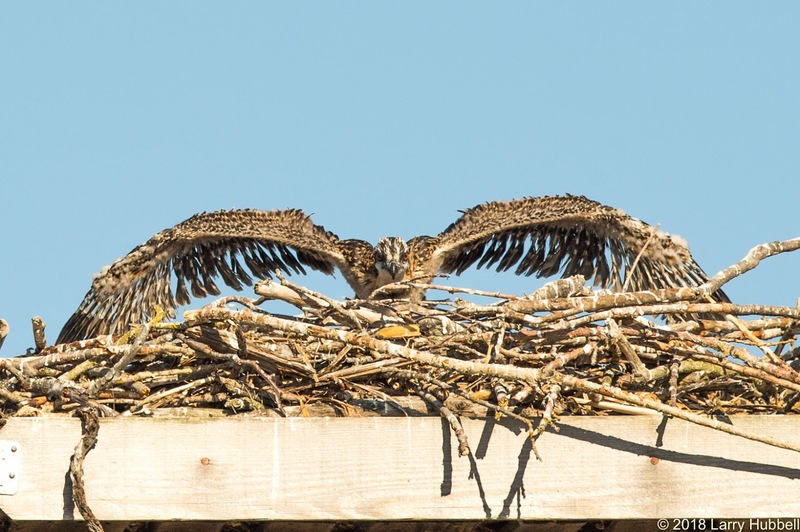 I wondered if some of our exceptionally warm weather might explain her freedom to leave the nest, still it seemed odd for her to leave the eggs unattended. On June 17th an adult was still incubating the eggs. Before the end of June the eggs were expected to hatch. 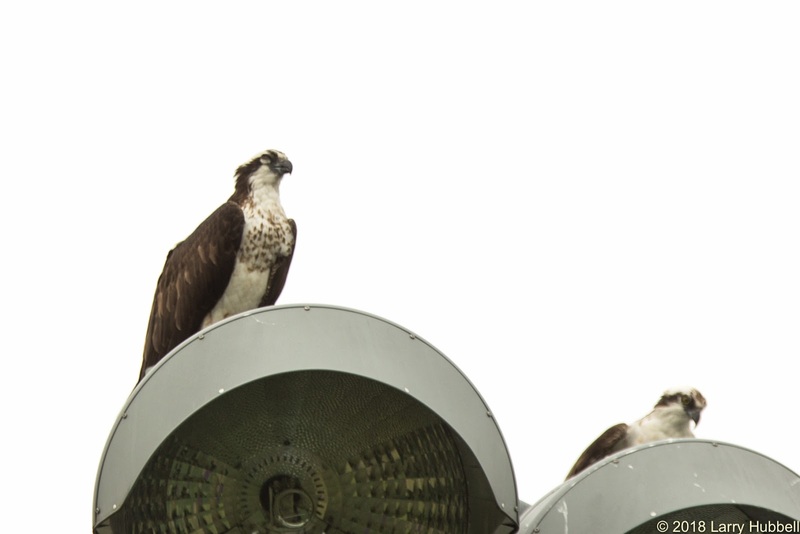 On June 28th, thanks to guidance from some eagle-eyed birders, I found and photographed this new pair of Osprey which have been trying to build a nest near the UW driving range. 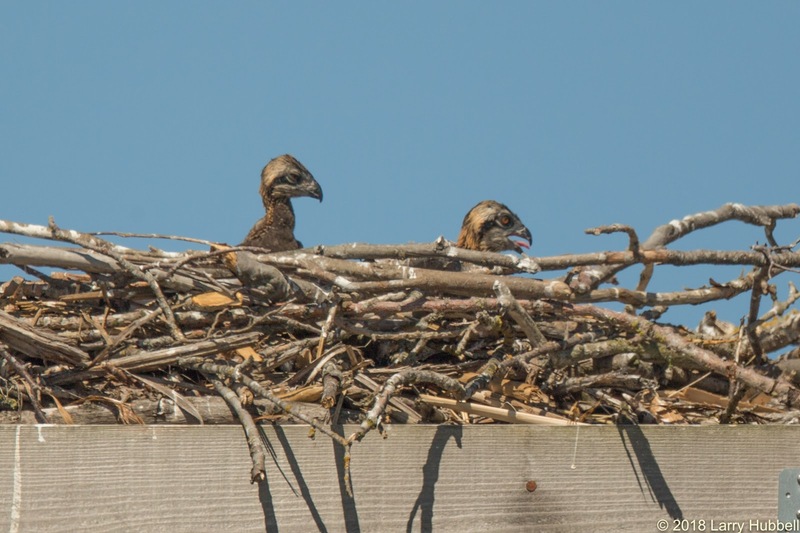 Given the time of year and the incomplete state of the nest it seems highly unlikely that they will be successful this year. I find it interesting to compare the amount of brown on this female with Lacey's necklace. 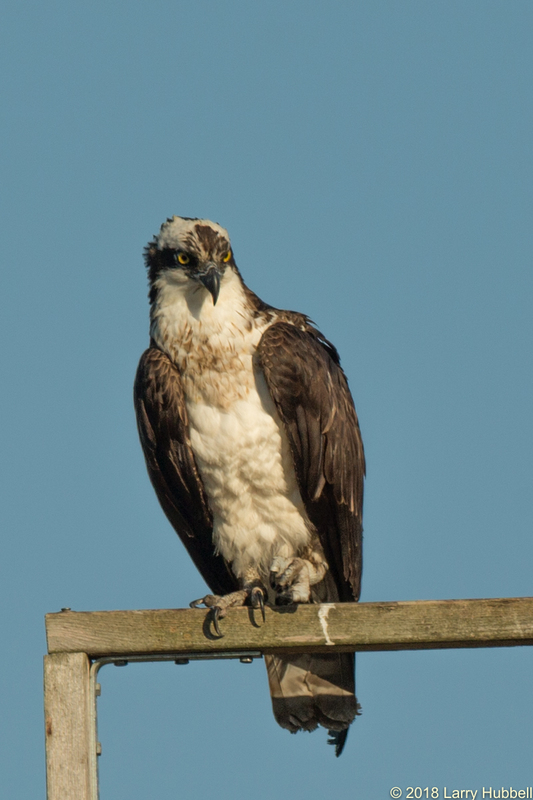 (See below) Female Osprey tend to have brown feathers on their breasts while the males have nearly pure white chests. This July 11th photo shows Lacey with her more delicate and restrained necklace. This was the same day that I first saw their two new hatchlings. Due to the size difference I have been calling them Hugo and Tiny. 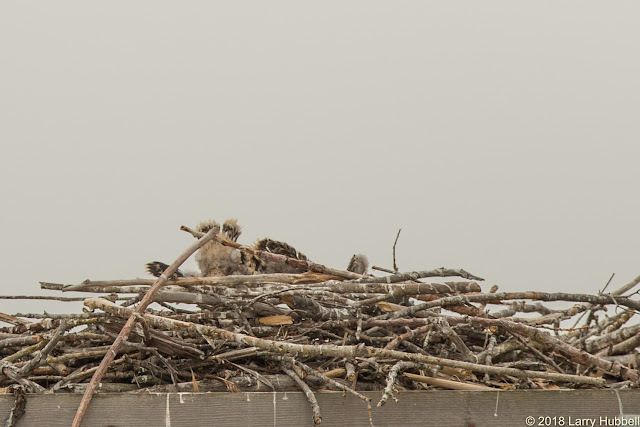 In the middle of the morning Lacey left the nest and flew east towards Yesler Swamp. As she disappeared in the distance it appeared she had left to go hunting. I did not see Chester on any of his usual perches. I was concerned to see the young birds alone in the nest. During the prior two years I do not ever remember seeing both parents abandon such young and defenseless birds. It was nearly forty minutes before Chester appeared in the area. As I headed home, I tried to persuade myself that his eyesight is much better than mine and he had probably been watching the nest at a distance. 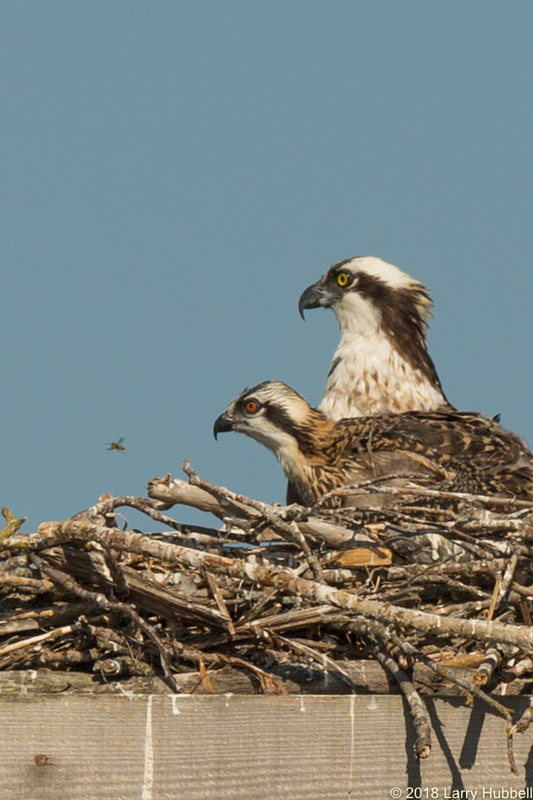 July 15th was the last time I clearly photographed both of the young in nest. On July 19th I thought I only saw one young bird, however this photo shows glimpses of a lot of different body parts and it is possible both of the little birds might be in the photo. It is also possible one of the young could have been laying down in the nest, totally unseen. While the absence of data cannot generally be used to prove a point, I was becoming uneasy. Had something happened to one of the young? I think the two tallest sets of feathers in the previous photo are tail feathers in the early stages of development. 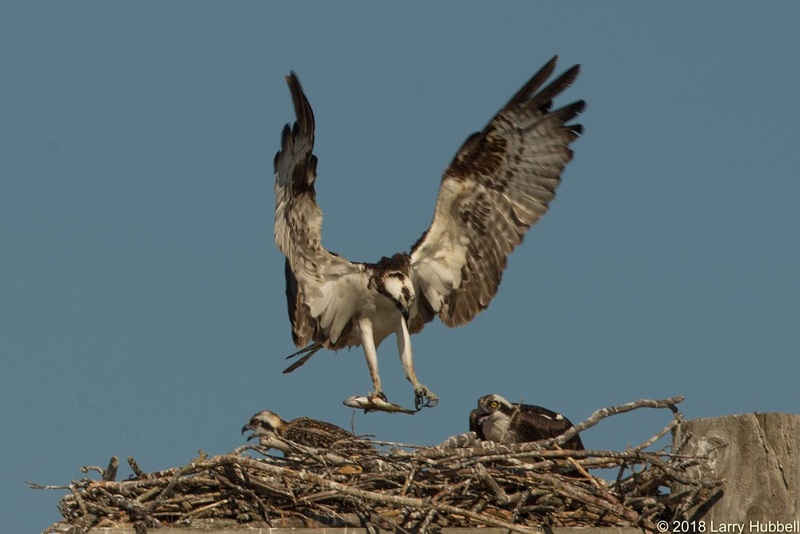 Yesterday, on July 26th, there was no doubt about the progress of this young osprey. I assumed that this must be Hugo given his previous size advantage and this impressive array of new feathers. While I watched him, he occasionally watched me as well. 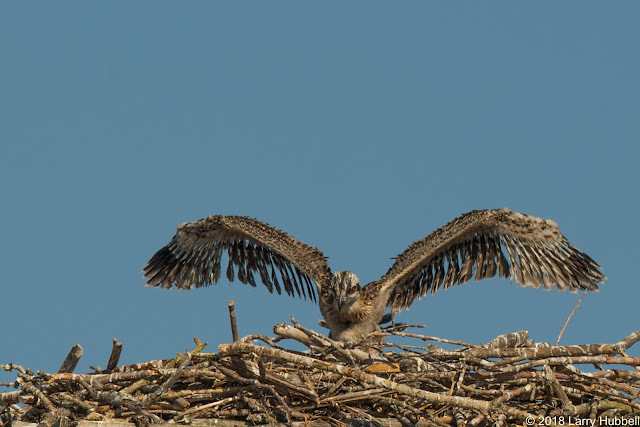 Clearly, these wings are not yet ready to hold air but he (or she) is working on developing the required strength. When Chester came in with food, the young bird stood up and expressed interest. 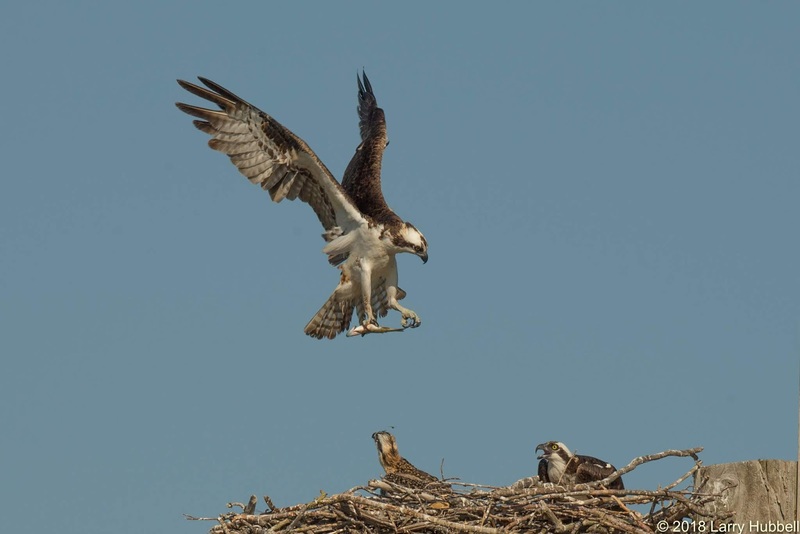 Chester held his wings nearly vertical as he dumped air and prepared to settle into the nest. Lacey, on the right, also expressed her pleasure at seeing airmailed sushi. At this point I concluded the absence of the second young bird was proof that the bird no longer existed. 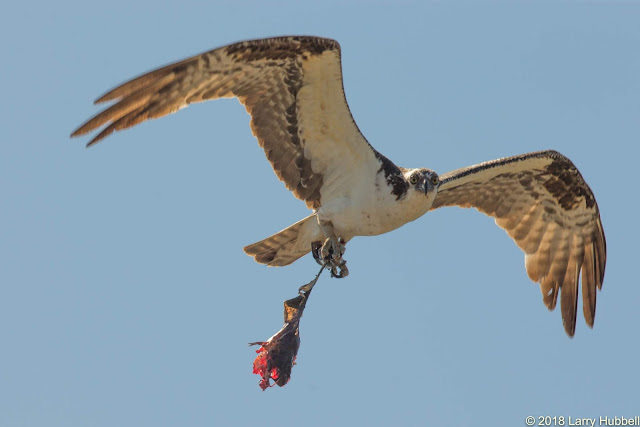 I have never seen a young, growing and hungry osprey sleep through the welcoming cries which accompany a food delivery. Thinking about food deliveries and things I have never seen reminded me of this July 3rd photo. Here Chester is bringing in big chunk of a large fish. 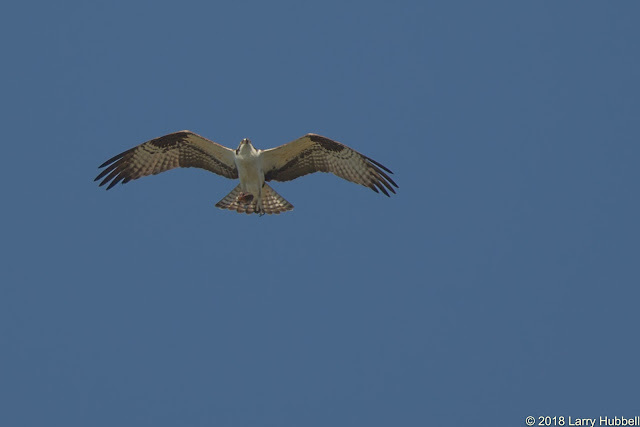 I wondered if he caught a salmon somewhere and was unable to bring the whole fish to the nest. Maybe he ate his fill and then brought the biggest remaining piece back to the family. Yesterday, as Chester settled into the nest the camera caught his wings in a very unique position. The feathers which are in the sunlight and facing forward toward the end of each wing, are his primary flight feathers. Osprey have ten primaries on each side. 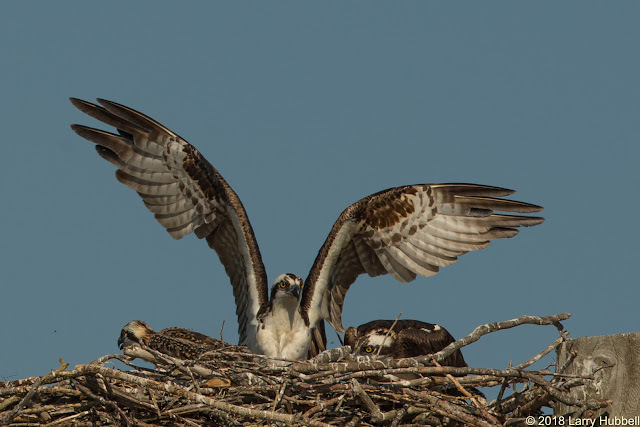 The top feather on each wing is called primary number ten. 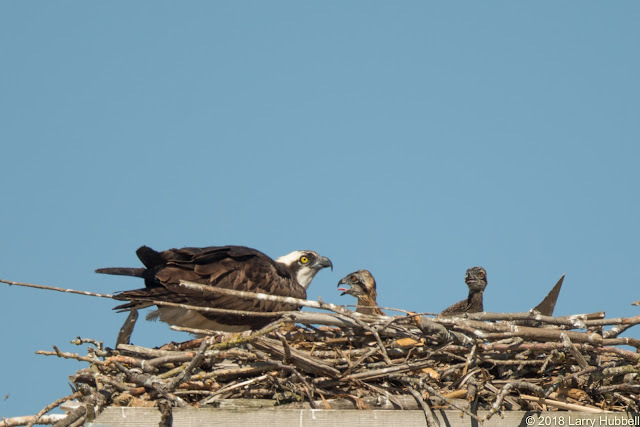 Click Here to see a photo showing the individual primary feathers. 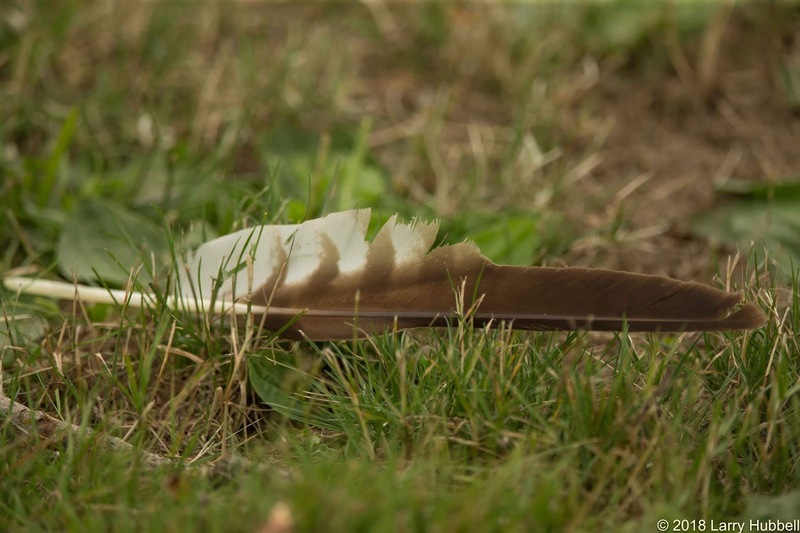 The first three feathers, e.g. primaries 10 - 8, are strongly notched. This photo shows a notched primary feather I spotted below the new attempted nest. By comparing the shape to the photos on the previous link and I am guessing this was a number nine primary. This photo, and the previous one of Chester, make me wonder if Chester has lost his eighth primary on each side and is growing new ones or whether we are just seeing a very strongly notched primary number nine. Did you notice that Hugo was orange irises? It will be interesting to see if they change to yellow before he heads south in the Fall. Here is one final photo of Lacey and Hugo. I certainly hope Chester and Lacey make a concerted effort to watch and protect Hugo. Hugo is totally dependent on his parent's protection until he or she learns to fly. I have no proof that the demise of the second nestling was related to a lack of protection. 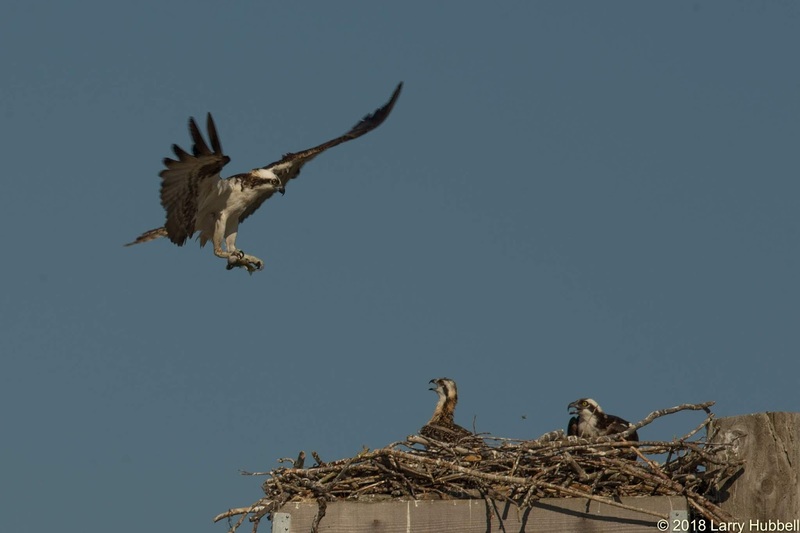 However, the change in the parental behavior this year has been noted by multiple observers. This leaves us with a number of questions. 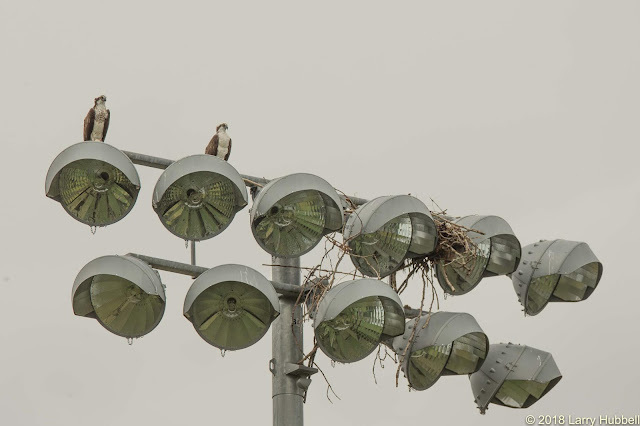 Did anyone see an eagle or another bird attempt to raid the nest? Why are the parents spending more time away from the nest? Is the supply of adequately sized fish diminishing in Union Bay? Is the competition for food increasing? Do the parents have to travel further to find food? While we cannot answer all of these questions we can review what we know. 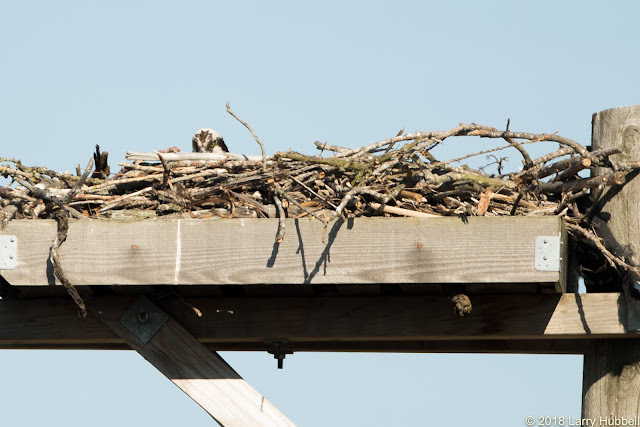 We know the population of resident adult Bald Eagles increased from four to six this year. We know the number of adult Osprey during the current breeding season increased from two to four. We have continued to see Great Blue Herons finding and eating fish in the water near the Osprey nest, but I have not noticed a change in their numbers. On the other hand there was a noticeable reduction in Double-crested Cormorants this Spring, however that may be normal behavior which I have overlooked in the past. 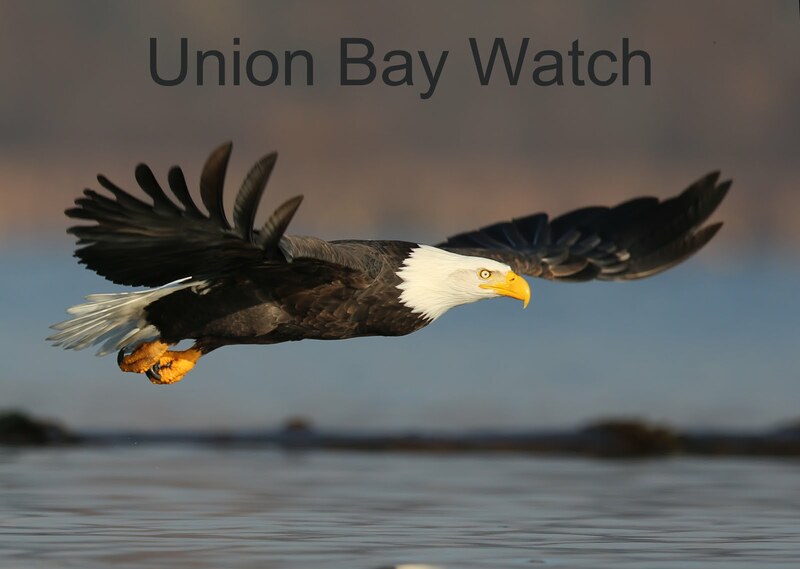 May be the most interesting question is, Given the extent of human development around Union Bay, do we have a responsibility to monitor changes in the health and productivity of the natural environment? 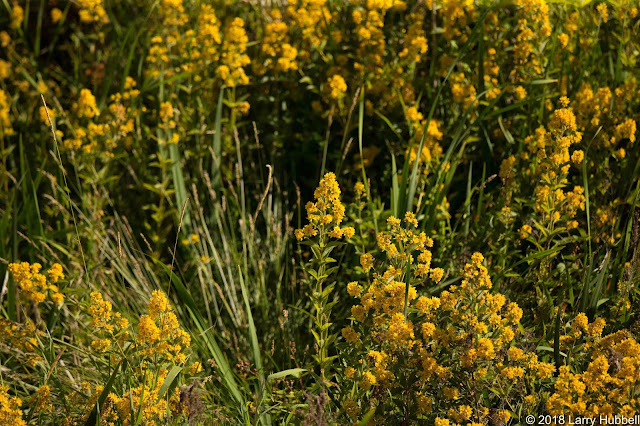 Is this yellow flowering plant native to the Pacific Northwest? What species is it? I spotted these two plants just east of Foster Island in Union Bay. The purple and 'gold' color made me wonder if they might have been introduced because they are the University of Washington Husky colors. 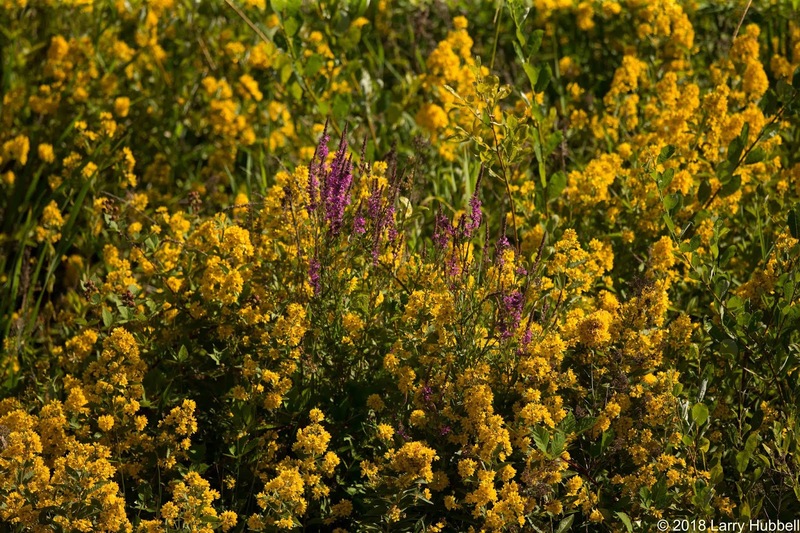 I am not an expert on loosestrife, but I am fairly certain this is a highly invasive plant which is illegal to even buy or sell in King County. It spreads so easily that it should never even be put in your clean and green. It out competes our native cattails. 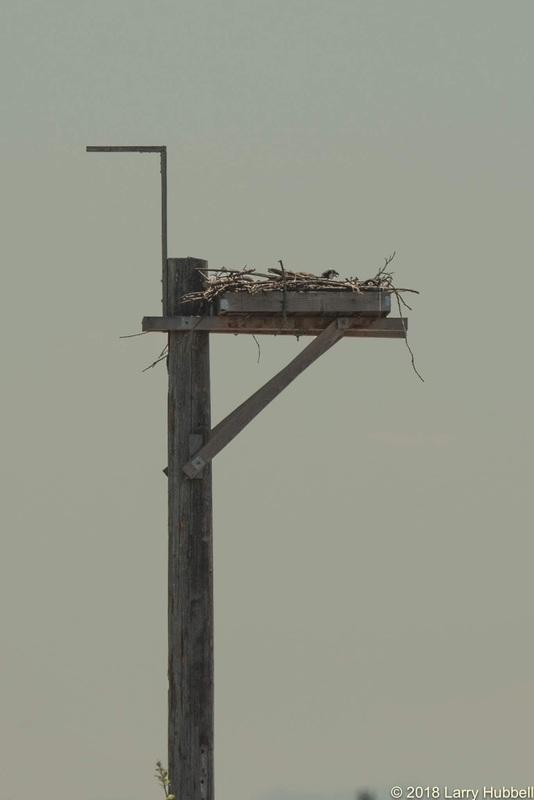 This in turn reduces nesting opportunities for birds like Red-winged Blackbirds, Marsh Wrens and Virginia Rails. This plant is also undesirable and invasive. Click on the highlighted names to learn more about dealing with these plants. Larry, Your stories and photos are absolutely amazing!!! Thank you Larry. We were confused about why Lucy was up in her nesting tree all alone and the nest was gone. You explained it all. Thank You. I will be checking on Lucy tomorrow.